Our premium LayFlat Press Book is made with quality materials like genuine leather and the heaviest hinged paper on the market, and bound so that when opened, it lays flat. Smooth Paper - This bright white paper utilizes a patented built-in hinge that allows for the book pages to lay flat when opened. Pearl Paper - Pearl Paper is manufactured with a built-in hinge that allows for book pages to lay flat when opened. It offers a subtle shimmer to any design, achieved by combining natural minerals with organic pigments. 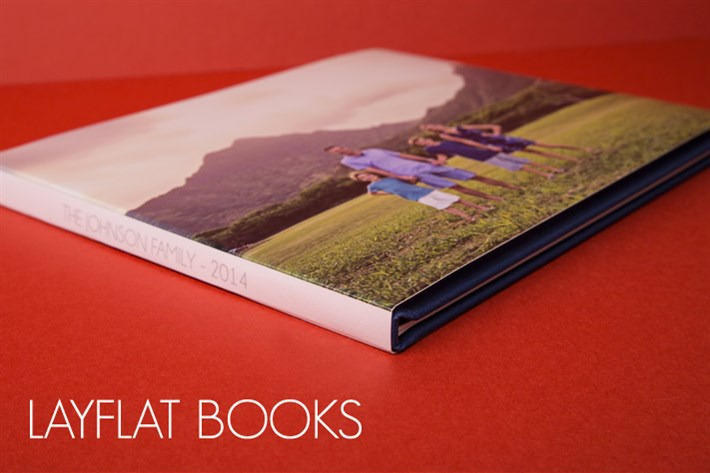 Custom Image Cover - Customize the cover of your LayFlat Book with one of your own images. The design will be printed on one of four substrates and wrapped around the album from front to back. If selecting canvas, your image is printed on canvas substrate and a coat of lamination is added for protection. Glossy covers are printed on E-Surface photographic paper with a coat of high gloss lamination applied. Our Fuji Pearl option is printed on Fuji Pearl photographic paper with high gloss. Satin Covers are made of E-Surface photographic paper with a coat of matte lamination on top. Bonded Leather - Our bonded line features strands of leather that have been bonded together. Please note, due to the production process of leathers, color tone may vary slightly.